❤【Features】: Excellent environmental performance, user-friendly design, strong weighing, and not easy to deform. ❤【Applicable occasions】: office, study, living room, bedroom, desk, desk, etc. 1. The desktop heightening frame not only corrects your perspective, improves your sitting posture, but also brings you a healthy cervical vertebra. 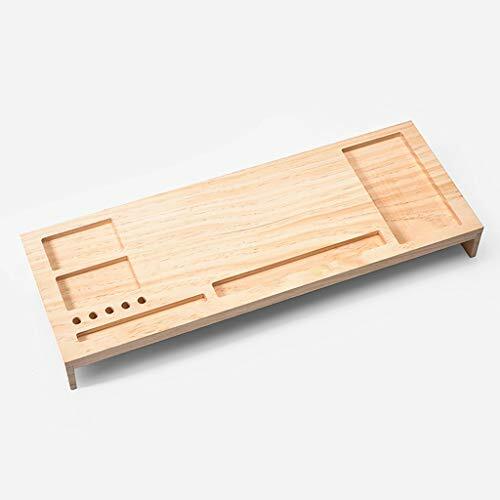 This is a powerful desktop organizer. 2. Reject unused space to make full use of the desktop. 3. For the mobile phone to type a reasonable storage space, reasonable design, to create a safe home for the mobile phone. 4. There are 4 holes and 2 slots in the pen holder area. Pens of different sizes can be easily inserted and the office is more efficient. 5. Increase the height of the monitor so that the user can look at the computer to reduce the burden on the neck and stay away from the cervical vertebrae. Raise the monitor to protect the cervical spine, a good product, do you have it? ★【protection of the cervical vertebra】: ergonomic design, raise the display 10cm to protect the neck shoulder less harm. ★【Line trough design】: The bottom of the back is designed with a cable trough to facilitate the passage of data lines and power lines, making the office more tidy and safer. ★【All things are used】: The heightening frame will be the physical storage of the keyboard, mouse and display. It is the full use of the desktop. ★【Increase storage space】: The desktop has a keyboard, display, items, pen holder, mobile phone, potted plant and other placement areas. ★【Decoratively decorated】: Place your favorite decorations to make your mood better and your office more relaxed and enjoyable.